A1 acrylic sealant. The duct body is supported with 1200 mm spacing (see diagram 1). The support system is composed (see diagram 2) of a 41 x 41 perforated crossbar and two threaded rod hangers. 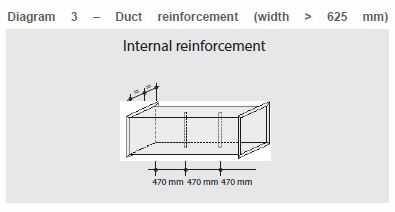 For < 625 mm duct widths, reinforcement is not necessary. 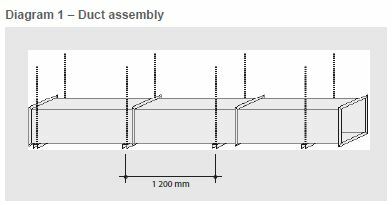 – Internal bracings composed of 13 x 17 mm (Ø int x Ø ext) steel spacers positioned lengthwise in the sections at mid-width and with 470 mm centre-to-centre spacing. 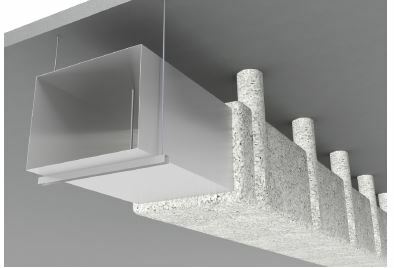 A first layer approximately 30 mm thick of FIBROGAINE® is applied to the duct (without primer). A 25 mm hexagonal grate (Ø = 0.8 mm) is then installed all around the duct. A second layer of FIBROGAINE® is applied to achieve the desired final thickness. The crossbar is encased in the duct body protection. 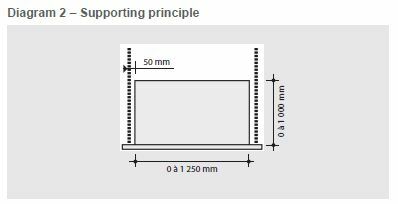 The threaded rods can be protected by a rock wool shell (30 mm, 65/70 kg/m3) as well as FIBROGAINE® or by installing a grate and applying FIBROGAINE®. In both cases, the total thickness of the protection (shell + FIBROGAINE® or FIBROGAINE® only) will have a thickness identical to that applied to the duct.